That is why Ogilvy Johannesburg, in partnership with Philips and The Nelson Mandela Foundation conceived a way to turn Mandela’s legacy into a tangible action that anyone can make their own. #ShavetoRemember is a call to action for all people in South Africa and beyond, to find the Mandela within them by getting his iconic haircut. But it’s more than a hairstyle. Getting the Madiba line shaved into your hair is a visceral pledge to bring his values of freedom, peace, forgiveness and equality to a divided world. Because it doesn’t matter who we are, where we come from or how small our sphere of influence is, we all have the ability to be the kind of leaders we wish to see in the world. When it came to finding a partner to realise the vision of using a haircut as a tool for change, Philips was the perfect fit. For over a century, Philips has been dedicated to creating solutions that make people’s lives better by instilling confidence in men and women, across the continent to be the best version of themselves,” says Ntutule Tshenye, General Manager, Philips. “Captivated by Madiba’s legacy, and as a proud partner of the Nelson Mandela Foundation, we believed that the campaign would bring his values to life through solidarity, reflection, and a deep sense of personal introspection,” he says. The film opens with a recording from the former President’s inaugural speech. This sets the scene as his words are delivered by a diverse cast of real South Africans. Every word in the ad is Mandela’s own. The characters, all with the famous Mandela line shaved into their hair, use Mandela’s wisdom as inspiration and guidance in their everyday lives and struggles, The underlying narrative being that everyone has a Madiba in them. A significant part of the campaign was to make the haircut accessible to the masses by means of activations and a special mobile barbershop, manned by an army of specially-trained Philips barbers and Philips clippers. 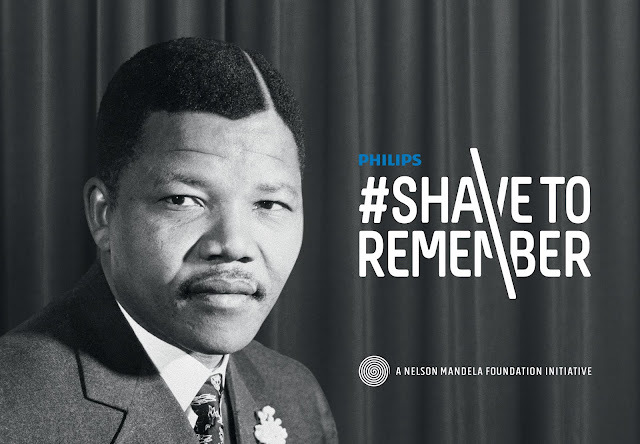 Limited edition Philips #ShavetoRemember clippers are being sold at major retailers across the country - the proceeds of which is donated to The Nelson Mandela Foundation. Every day more people are sharing their own Madiba haircuts on social media. He didn’t die, he multiplied. And his legacy will live on for as long as we remember to remember that there is an alternative to what our daily news cycles are showing us. Headline and copy text: #ShaveToRemember: How an iconic haircut is inspiring a generation to bring Nelson Mandela’s values of freedom, peace, forgiveness and equality to a divided world.